This three-dimensional molecular model shows a prion protein with four extra octarepeat sequences as a result of an insertional mutation in the gene. The extra sequences change the copper-binding properties of the protein. Image from Stevens et al., PLoS Pathogens (2009). Researchers at the University of California, Santa Cruz, discovered a striking relationship between changes in the copper-binding properties of abnormal prion proteins and the clinical features of prion disease in patients with certain rare, genetic mutations. They described their findings in a paper published by PLoS Pathogens on April 17. "The loss of copper regulation may play a very important role in prion disease progression," said Glenn Millhauser, professor of chemistry and biochemistry at UCSC and corresponding author of the paper. Prion diseases are fatal neurodegenerative brain disorders caused by a misfolded form of the normal cellular prion protein. Human prion diseases include classic and variant types of Creutzfeldt-Jakob disease (CJD). The vast majority of CJD cases are sporadic, meaning they are thought to arise from spontaneous misfolding of the prion protein. Infectious transmission of the prion accounts for a very small percentage of cases, while about 10 percent of cases are caused by inherited defects in the structure of the prion protein. Millhauser and his coauthors studied the effects of insertional mutations that cause extra sequences of eight amino acids (known as the octarepeat sequence) to be incorporated into the prion protein. Whereas the normal prion protein has four octarepeat segments, insertional mutations can result in as many as nine additional octarepeats. The extra octarepeats change the properties of the prion protein and eventually lead to the progressive brain damage characteristic of CJD. These insertional mutations are known from a small number of cases reported in the literature, involving about 30 families and 108 individuals. Reviews of these cases have suggested that higher numbers of inserts are associated with earlier-age onset of the disease. The octarepeat domain takes up copper ions, which are essential for the proper functioning of neurons. Millhauser's lab looked at the effects of insertional mutations on the prion protein's ability to bind copper. Graduate student Daniel Stevens, lead author of the paper, and postdoctoral researcher Eric Walter performed experiments using magnetic resonance spectroscopy to study how prion proteins with different numbers of octarepeats interact with copper. The normal prion protein responds dynamically to varying concentrations of copper by changing the way it binds the metal, allowing it to soak up more copper ions at higher concentrations. When the researchers studied proteins with octarepeat inserts, however, they found that the protein loses this ability to switch binding modes as the number of inserts increases beyond four. "We got excited when we saw that the threshold in the effects on copper binding corresponds to the threshold for age of onset that was seen in the clinical studies," Millhauser said. The average age of onset is 64 years for patients with one to four extra repeats, but for patients with five to nine inserts the average age of onset drops to 38 years. 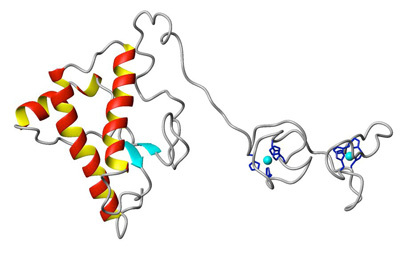 Similarly, Millhauser's group found a transition in the copper-binding properties of the protein that occurred between four and five inserts, the same threshold observed for early-onset disease. For the statistical analysis of clinical cases, Millhauser enlisted the help of statisticians David Draper and Abel Rodriguez, professors of applied mathematics and statistics in the Jack Baskin School of Engineering at UCSC. Draper and Rodriguez used several approaches to analyze the pooled data from case studies in the literature. Their results are consistent with the existence of two groups of patients: a group with one to four extra octarepeats and late-onset disease, and a group with five or more inserts and early-onset disease. The normal function of the prion protein remains uncertain, but the new findings support the idea that it plays a role in the regulation of copper ions in the brain, Millhauser said. The prion protein is anchored to the outside of the cell membranes of neurons and is concentrated at the synapses, the junctions between neurons where signals are transmitted. The concentration of copper in the synapses is dynamic, and as the copper concentration goes up and down the prion protein switches from one copper-binding mode to another. Millhauser suspects that the prion protein soaks up excess copper ions to protect brain cells from harmful reactions. "The prion protein goes into a neuroprotective mode at higher levels of copper, and that mode gets lost when extra octarepeats are added to the protein structure," he said. While changes in copper binding begin to appear with four or more extra octarepeats, other changes in the molecular properties of the prion protein occur with as few as one insert. These changes include an increased propensity to clump together and form protein deposits in brain tissue. Research on prion diseases has tended to focus on these aggregates and deposits, which are thought to have toxic effects on brain cells. But the strong relationship between changes in copper binding and clinical progression of the disease suggests that more attention should be given to the normal function of the prion protein, Millhauser said. "The fundamental issue may be the loss of copper regulation, and excess copper may be what causes the cytotoxicity," he said. In addition to Millhauser, Stevens, Walter, Rodriguez, and Draper, the coauthors of the PLoS Pathogens paper include Paul Davies and David Brown of the University of Bath. This research was funded by the National Institute of General Medical Sciences (NIGMS).